Published by Truran in October 2002 and 2007. This book traces the origins of the artists that dominated the Newlyn School of painting at the turn of the 19th century and the colony that arose early in the 20th century around Lamorna. 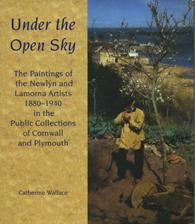 With biographies of most of the artists involved, the examples used to illustrate it are all from public collections in Cornwall and Plymouth.